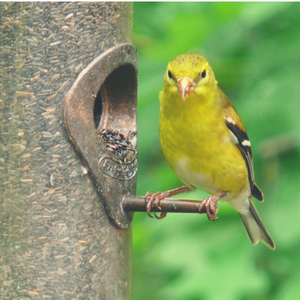 Feeding the backyard birds and wildlife is fun, easy and great for the whole family! Providing food & shelter for the birds can help them survive a harsh New England winter and provide them with the nutrition they need to raise a brood in the nicer months. Buy big bags and save money on sunflowers, peanuts, safflower, thistle and mixes ! If you are buying seed mixes at the home stores or supermarket you need to come see us! Our mixes don’t contain cheap filler seeds – if you see a lot of red or yellow in your current mix those are filler seeds – birds don’t like these cheap seeds and will leave them. South Shore Treat - Our #1 Seller! This is a custom-designed blend that we created to attract the largest amount of birds with no wasted seeds. The mix is loaded with sunflowers, peanuts, safflower and more. 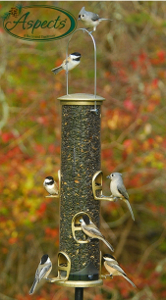 The birds go crazy for it and is our #1 seller! Give it a try and see what your birds think of it! Try our mixes – there is a difference! We select quality bird feeders from Droll Yankee, Aspects and others to offer a variety of options to fit both your tastes & budget. Love the birds but hate the Squirrels? Let us show you some truly squirrel-proof feeders! Yes, they do exist and we guarantee you will be happy! Wild Bird products you know from a name you can trust!